Burco TSSL14 Stainless Steel Toaster from Gillmans Commercial Appliances. SPECIAL OFFER WHILST STOCKS LAST!!!!!! 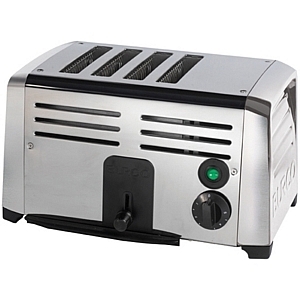 Variable timer control enables the customer to select their preferred shade of toast. High lift mechanism for hard to reach toast. Removable crumb tray prevents any build up on the counter-top. Non-slip feet for greater safety.